(CNN) -- The federal government will give $1 billion in grants to law enforcement agencies in every state to pay for the hiring and rehiring of law enforcement officers, Vice President Joe Biden and Attorney General Eric Holder announced Tuesday. 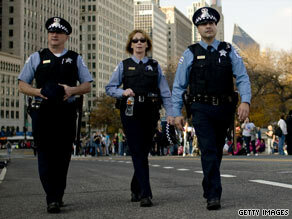 Police officers in Chicago, Illinois, patrol the streets in November 2008. The money comes from the stimulus bill -- the American Recovery and Reinvestment Act of 2009 -- the officials said. The law is designed to help pull the U.S. out of its recession by providing and saving jobs, and helping those most affected by the downturn in the economy. Beneficiaries can include state, local and tribal governments. The Department of Justice received more than 7,200 applications for more than 39,000 officer positions, representing a total of $8.3 billion in requested funding. "The tremendous demand for these grants is indicative of both the tough times our states, cities and tribes are facing, and the unyielding commitment by law enforcement to making our communities safer," said Attorney General Eric Holder in a statement. Biden spoke of the bravery of police officers who never know when they might be shot, even on a simple call. With rows of police officers standing behind him, he pointed out the hazards and uncertainty of police work. "It's just astounding to me how much we take for granted what you do, and thankfully how much you take for granted what you do," said Biden. "We ask you to go out to defend us, and you're entitled to be equipped to defend us," he added. The Recovery Act includes $4 billion in Department of Justice grant funding to local law enforcement. Some of this money was distributed to states previously to help crime victims, women who are targets of violence, Internet crimes against children and other needs. The current round of grants will be awarded to 1,046 law enforcement agencies in all 50 states, and will provide 100 percent of the approved salary and benefits for 4,699 officers for three years. Police departments that receive the money must retain the grant-funded positions for a fourth year. The grants will be administered by the U.S. Department of Justice's Office of Community Oriented Policing Services (COPS). Funding decisions were based on reported crimes for the previous calendar year, community policing activities, budget changes, and poverty, unemployment, and foreclosure rates in the area. "These officers will go to the places where they are needed the most," Holder said. Philadelphia Police Commissioner Charles Ramsey, who attended the news conference, said five police officers were killed in the line of duty in his city between May 3, 2008, and February 13, 2009. "So violence is very much a concern here in Philadelphia," he said. "There is far too much violence taking place every day on the streets of our city." Pennsylvania plans to create or save 93 law enforcement positions statewide by awarding more than $20 million to 19 law enforcement agencies. The Philadelphia Police Department will be able to create and or preserve 50 jobs, according to the statement explaining the grants. Pennsylvania is one of the hardest-hit states in terms of economic decline, officials said. More than 19 percent of the families in Philadelphia live in poverty, and the unemployment rate jumped from 6.4 percent in 2008 to 8.8 percent in 2009.